Conflicting data have been reported from recent genetic association studies regarding the association between PAX6 and myopia. To further clarify this relationship, we conducted a large case–control study of more than 2000 subjects and a functional assay, to obtain a more reliable result. the other carries protective allele T (denoted as rs662702T). The study was approved by the Institutional Review Board at the Kaohsiung Medical University Hospital. The research adhered to the tenets of the Declaration of Helsinki. The difference in genotype distribution between cases and controls was marginally significant (P = 0.063 from the χ2 analysis) for SNP <u>rs644242</u>. The CC genotype had an OR of 2.3 (nominal P = 0.009) for extreme myopia when compared to the combination of AA and AC genotypes. 重新分组：The empiric P value was 0.0448 for the association between extreme cases (≤ −11 D) and controls (≥ −0.5D) for rs662702. These results suggested that the risk C allele had lower protein expression levels than did the protective T allele. > The position of rs662702 is next to the seed region of miR-328 and the C-to-T substitution leads to a mismatch between miR-328 and PAX6 mRNA paring.Our functional assay indicates that the risk C allele causes a lower PAX6 expression level than the T allele, which can be due to the knockdown effect by miR-328 on the C allele. If so, SNP rs662702 also belongs to a new category of SNPs called mirSNP. A decreased expression of PAX6 can result in an increased expression of MMP2, and an increase of MMP2 expression has been implicated in the pathogenesis of myopia. 34 Accordingly, our initial finding based on the statistical significance can be further supported by these functional studies. risk allele can reduce PAX6 protein levels which significantly increases the risk for myopia. This functional SNP is located at the miR-328 binding site, and the risk allele may be downregulated by miR-328, leading to a lower level of PAX6 protein. > Tsai et al. investigated a Chinese population residing in Taiwan and reported a significant association between the common C allele of rs667773 at PAX6 and extreme myopia (≤ −10 D), whereas no significant association was found for high myopia, defined as ≤ −6.0 D. Although we did not genotype rs667773, it can be tagged by our initial tSNP rs644242 (r 2 = 0.92) and our functional SNP rs662702 (r 2 = 0.86) according to the Han Chinese data in HapMap. In concert with the finding of Tsai et al., our data suggest that both rs644242 and rs662702 are more related to extreme myopia but less associated with high myopia. 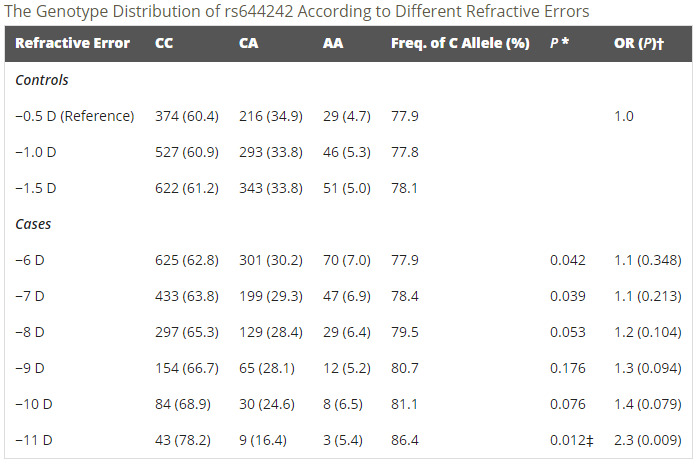 We conducted a meta-analysis using data from Tsai et al., and the present studies, and the results showed that the common alleles had an OR of 2.9 (P < 0.0001) for extreme myopia in the Chinese population. Using the family data set, the Han et al. 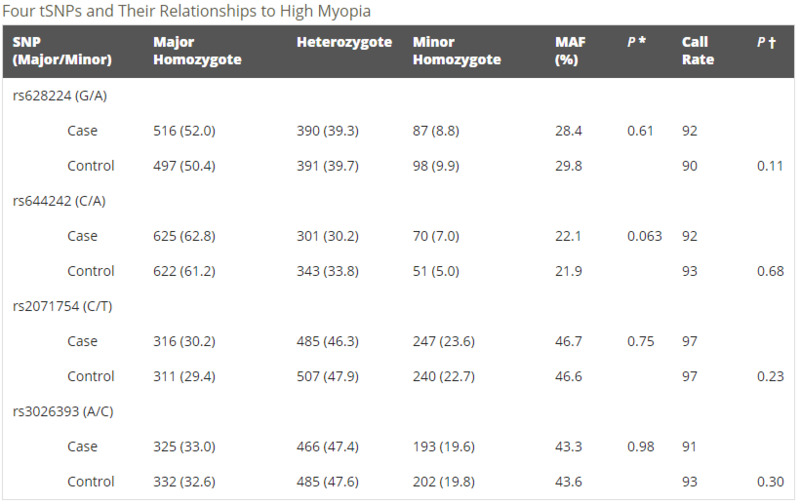 16 study revealed a weak association (P = 0.0458) between rs667773 and high myopia (≤ −6.0 D). However, they did not specifically examine the association with extreme myopia. On the other hand, they did report the most significant SNP, rs3026393, with a P < 0.001, which was not significant in our study. > Our study design has strengths and limitations. We used a large number of study subjects to reduce both type I and II error rates. The statistical finding is further supported by the functional experiments, and the significant 3′UTR SNP can be one of the causal variants. Our study population was relatively homogenous in terms of ethnicity, geographic location, and age. As a result, several undetectable confounding factors can be minimized. A previous study investigating the population admixture of Taiwanese also indicated high homogeneity among the Taiwanese subpopulations. 38 In addition, we have assessed population stratification in subjects recruited from the same geographic locations by our team, and the inflation factor was 1. 39 Therefore, population stratification is unlikely to be an explanation for our association results. Using permutation, we also found a significant P value under the consideration of multiple testing. However, the main finding of a significant association was based on only 55 cases of extreme myopia. A meta-analysis is warranted to provide a sufficient power to validate our finding.